Home CDN , children , crafts , feature , February , holiday , holidays , homeschool , papercrafts , printables , US , worldwide February 10th - Featuring Umbrella Freebies! February 10th - Featuring Umbrella Freebies! -- In honor of one of the world's most invaluable inventions. The oldest recorded collapsible umbrella appeared in 21 AD, in Ancient China. Qin Shihuang's tomb revealed a terracotta army carriage which had a permanently open umbrella, dating from 210 BC. Umbrellas were also found in Nineveh, Persepolis, Ancient Egypt, and Greece. On a rainy, day, we are sure glad someone was smart enough to invent it. 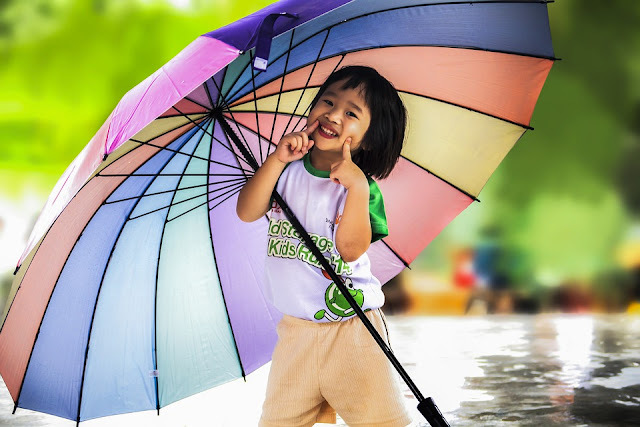 It is also increasingly popular to use umbrellas to shade ourselves from harmful UV radiation, and the heat of the sun. On this holiday, you are encouraged to take a walk in the rain and enjoy your umbrella. • Windproof Travel Umbrella -- Super large umbrella can accommodate up to three people at the same time. Easy operation. Measuring just 11" long and weighing less than 1l lbs, the folding handheld umbrella is extremely packable in purses, briefcases, backpacks, luggage and more. Fortified with 10 resin-reinforced fiberglass ribs which flex slightly to withstand powerful gusts without turning inside out. • Red Heart Shaped Parasol -- This beautiful Heart Shaped Brolly is perfect for wedding and would be a wonderful photo prop on the day, whatever the weather. Lets you stand out from the crowd when taking an afternoon stroll along the beachside promenade or in the heart of town. On scorching hot days, use a Heart Shaped Brolly to create some personal shade. You will want it to rain when you have this Heart Shaped Brolly for your very own. Makes rain a romantic experience. - The first known recipe for brownies appeared in the 1897 Sears Roebuck Catalogue. What everyone seemed to love about brownies, besides their delicious taste, was how quick and easy they were to make! Since then, the original brownie recipe has transformed into a wide variety of flavors to suit every brownie lover's needs. Celebrate today by enjoying the sweet, rich, and creamy flavors of a cream cheese brownie! - One of the ways to encourage long term marriage relationships is to celebrate World Marriage Day in your own community. Encourage couples to do activities which will strengthen their own marriages, such as reading a book on marriage together or attending a marriage communication course or encounter. - The movement which resulted in the World YWCA began in England in 1855 in the midst of the Industrial Revolution and the Crimean War. Founded through the convergence of social activist Lady Mary Jane Kinnaird's General Female Training Institute, and committed Christian Emma Robarts' Prayer Union, it sought to be a social and spiritual support system for young English women. - A day to remember Samuel Plimsoll (born February 10, 1824), the Sailor's Friend, a coal merchant turned reformer and politician, who was elected to the British parliament in 1868. He attacked the practice of overloading heavily insured ships, calling them coffin ships. His persistence brought about amendment of Britain's Merchant Shipping Act. The Plimsoll Line, named for him, is a line on the side of ships marking maximum load allowed by law.